Friends School's 'ActiKids' receive their Company of the Year Award from Education Minister John O'Dowd. 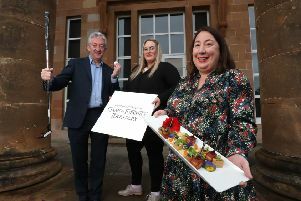 Young Enterprise has marked the achievements of budding entrepreneurs from Lisburn who the charity has supported through its business start-up programme this year. The event came as Northern Ireland prepares to be named European Entrepreneurial Region for 2015/16 next month. Invest Northern Ireland supported the event where 650 young entrepreneurs crammed into Titanic Belfast to be honoured at Celebrate Success 2015. The charity has worked young people from Friends’ School, Wallace High School and Park View Special School this year in a particularly successful year for the area. The Friends’ School company ‘ActiKids’ created a children’s activity book and building on the success of their launch event at the Lisburn Waterstone’s store, were named Company of the Year for the South East Area. The six companies started by Wallace High School students were also recognised for their achievements through their work with the charity. Park View Special School’s company named ‘Chalkie-Woccy-Doo-Dah’ sold a range of chalkboard items including plaques, mugs and other gifts. The company received their certificate of recognition while Park View student Junior Rooney was named Young Entrepreneur of the Year for the South East Area. Speaking at the event, Education Minister John O’Dowd praised the achievements of the young entrepreneurs in developing skills that will benefit them in life and work.